Location : Where I don't wanna be, but its nice. Description: Crow is a weapon that is both meant to battle the robotic forces of Sigma in physical form and also wage war with the Sigma Virus itself in the "cyberworld". In his physical form Crow is based heavily off of the spec's of former Hunter - now known criminal, the war machine Vile. He has weaponry based in nearly every inch of his frame, located in his arm's, legs and his right shoulder. His arm's carry his most commonly used and weakest weaponry, the Vulcan. The Vulcan is a fast and easily utilized weapon that can fire quickly while allowing Crow to remain fully mobile. It is fast and it's range is similar to that of a standard bullet though these rounds are far more destructive as they are the size of a standard rifle round and can be rapidly fired with great accuracy. On his leg's he carry's larger explosive weaponry however he does lose mobility in his legs while he is firing so as to stabilize the shot and make sure he does not get propelled backward as well. The shot is a large sphere shaped projectile that detonates after a set time frame which can be hard to determine as Crow can launch with varying velocity of his choosing to make the shot's detonate where he need's them to, detonating with force to destroy large artillery. On his shoulder he carrie's his signature weapon, the Front Runner. This large cannon is capable of adjusting a complete 180 degree's backward to forward, allowing it to fire at both ground and air targets. This weapon is the most destructive in Crow's physical arsenal and he can hit targets with pinpoint precision, though with the amount of explosive power contained in each round this is not something easily noticed. The cannon can also be used in conjunction with momentum to launch Crow very quickly for evasion. In addition to his weapon's Crow's physical form is metallic and he has a self repair function that he can initiate when he has extra power to spare. (ooc: If there is another thing that can make this function let me know.) Also his has four jet's that make him capable of flight to greatly enhance his weapon to target maneuverability, these are located under the bottoms of each boot and on the rear of both of his shoulder blades for quicker momentum and for allowing flight in different directions. Crow's faceplate is the same as Vile's except for the missing insignia which was burned with a "C" for his namesake and easier identification, this faceplate also allows standard vision along with night and thermal views for easier target identification. In addition to these weapon spec's his design is meant for evolution, each weapon capable of harnessing upgrades which can change the overall capacity of a weapon and it's characteristics, though he is still waiting for a worthy designer as no one has been able to make anything that make him more formidable to date. Crow can also transmit his consciousness into the "cyberworld" of compatible devices, it is rumored that he should be able to achieve this wirelessly but so far he has been only able to achieve this with a direct wire link from himself to the device. While transmitting he is at great risk as he has no control over his physical body though he is alerted when damage is sustained. He has jack's in each appendage and in his chest, though he has multiple jack's he can only transmit his Software form to one compatible device at a time, though he can transmit data and himself between any devices he is connected to. If his body becomes disconnected before he re-sync's himself into it, he is stuck in the device he is in, limited by its own way's of exit until his jack is reconnected. This form is meant to battle Sigma's forces on the digital level, allowing him to undo damage from the virus from spreading and theoretically if destroyed in time, undo a transformation from a artificial intelligence going "Maverick". 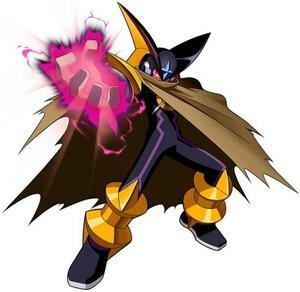 In this form, Crow projects himself closer to the Megaman adversary, Bass in appearance (however he still has his signature 'C on his forehead) and also lends from some of his weaponry. He carries the ability to drain energy from the area around him to increase his power, restore his 'life force' and lastly also he has seen that he should have a similar design of Bass to where he can absorb abilities of anything absorbed this way however he has not learned how to activate this particular ability. While he is in his digital body he can also redefine his physical form and change certain aspects of himself, namely creating weapons where there are none and also changing his appearance however his size remains the same as these changes restructure him but cannot add or remove digital mass, also he appears to hover over the ground in constant flight though he technically is still standing on the solid ground, and by blending in with his surroundings he can stealth though while moving he loses some of his perfect camoflauge allowing other's too see the slight changes if they have direct eye contact. In Software form, Crow His main weapon of choice is changing either of his hand's into C(Crow)-Buster's which he can dual wield and launch powerful red energy rounds towards targets, or creating red energy blades anywhere around his hands which can extend up to an extra arm's length deal devastating damage to delete targets. Crow can also extend a digital Aura Wall around himself that can regenerate from nearby drained energy and is also easier to regenerate then his own body. While in this form he has a natural capability of asserting himself deeper into the 'cyberworld' through a type of integral hacking, allowing him to have access to locked program's, identities or redefine certain aspects of the cyberworld, though it is not perfect and for higher level security he does need to locate extra clearance to get more access. 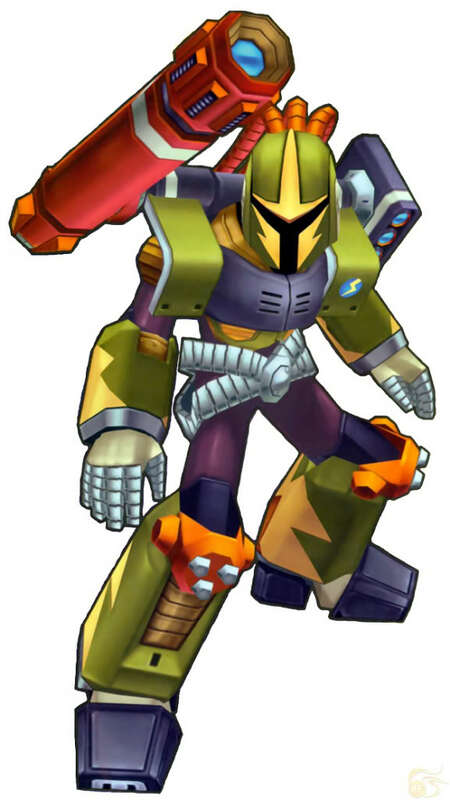 Both of these form's and capabilities make Crow a match for the Sigma force's spreading through his homeworld, his combat capabilities as well as the technique to rescue reploid's before they go Maverick have lead to great fame to Crow and quick promotion's to the front lines. Personality: Crow is a reploid, an engineered humanoid who has not only achieved "life" but is capable of human emotion. He has been burdened with his body being in the image of an enemy of the state 'Vile' a reploid who betrayed his city and killed many innocent's and because of that he strives to be the best at being himself so as not to be a mere duplicate of Vile though in doing so tends to show the independence that Vile himself had while he was named a hero. He is quick to anger whenever Vile is mentioned and especially whenever he is compared to him, going so far as to re-dye his armor and when he burned the letter C into his headpiece to remove similarities. When he is in his cyber form instantly he changes from looking like Vile to what he imagines himself to be, and in this form he seems to find expressing emotion much easier as he can actually show it, especially with the huge smile he often wears there where he has the freedom and ability to be so much more.He is driven not by a sense of 'justice' exactly, however he does know what is right and wrong and will not hesitate to do the right thing even if other's will suffer because of it. He may seem cold at first but he will do what needs to be done to protect those that cannot protect themselves. In all actuality he is driven by two goals, to find Vile and get answers he cannot find elsewhere, and to never let down Dr. Cain to whom he owe's everything to. War has spread throughout the world, humans have been pushed near to extinction, and their last line of defense, the sentient creations the reploids have thus far been unable to turn the tide of the war. The reploid's had the capability to become great war machines however their enemy the Sigma Virus is capable of infecting the minds of reploid's and driving them Maverick, leaving the once self aware reploid a machine bent on destroying everything in a fit of incurable madness. There was an elite force assembled to combat these forces, an organization labeled Maverick Hunters. Of these Maverick Hunters there were three names that were always mentioned, X, Zero, and Vile and they fought the forces of the Sigma Virus managing to finally keep civilization prospering within the last bastion of resistance, the fortress city Neo Arcadia. The city protection is enforced by the Maverick Hunters allowing safe haven for the residents, beyond the safety of the city however is all lost, remains of the war are still littered throughout shattered cities and Maverick infested lands - no one wanting to live can leave Neo Arcadia. The protection of the city has it's benefits and the citizens can continue to live a semi-normal life. However the city's peace would not last and the elite troops were unable to ensure the cities safety. Vile, tired of living as anything short of the most powerful and famous Maverick Hunter began a revolution within the city which lasted 72 hours, which included the spread of the Sigma Virus within the walls. Among the designs were schematics for a new body for Vile, merging the different plan's into a new body however the designs were missing key components which is what kept the body stored away. This body would be scavenged and researched by the Maverick Hunter's however unbeknownst to them though the body was unable to function, the AI within was active and had been for some time though was unable to act with his immobile form. It would be many years and after many attempts to study and activate the reploid body failed, the 'Vile Duplicate' as it came to be called was left in the care of Dr. Cain, who even with his advanced knowledge could not find some way to make the machine operable. However, within the body the AI ran rampant trying to activate itself. Through sheer luck, ignorance, act of god or any combination of these factors someone left him connected straight into the main core of Dr. Cain's lab and finally seeing an exit, the AI transferred his consciousness to the lab, surprising Dr. Cain by the amount of control that he was able to assert within his own creation. The AI was found to be reasonable though incomplete, a relic from a much older age. Initially the only thing that the AI could communicate sensibly was that he was haunted by visions of a broken land being picked apart by crows, and the never ending visions of the crows haunted it. It would still take some time for the AI to mature and become complete through the aid of Dr. Cain, but what was even more interesting was hidden within the AI were the remains of the plan's to make it's body complete, it was a puzzle that none have been able to solve, not even the AI who's memory was fragmented to the point of not even knowing what it was or who designed it. After a time, it began to refer to itself as Crow, and though it was thought that he was secured to the lab alone, he did have access to the near whole of Neo Arcadia and did his own research into those who would become Maverick and those who hunted them, and while exploring the cities systems managed to come upon a plot to infect the Sigma Virus into a large portion of the city, and while X and fellow hunters were exterminating the physical bodies of the Maverick's they were already within the system and without training or a shred of thought for self preservation, Crow managed surprisingly to destroy the AI's before they could cause any damage to the city Dr. Cain diligently tries to aid and protect. Before he could make it back to the lab, he was noticed and traced by X who made contact with Dr. Cain and after much convincing, planned to integrate Crow into the Maverick Hunter's when his body was functional. When they did manage to get the body functioning, he swore to uphold what was right instead of the standard oath to protect Neo Arcadia's best interests for which he received perturbed looks, as Vile had said the exact same thing in his beginning. When active he has been discriminated and even mistaken for Vile for having such a similar frame though being an entirely different entity, and to make up for this burned a large 'C' into his forehead to distinguish himself, also taking the time to change his color scheme to green as opposed to Vile's purple body. Crow has been promoted and now stands equally among his mentors X and Zero in both fame and rank. He surprised many with how fast he was able to rise through the social ladder and finally the city has grown to respect him and separate him from Vile, though it would be a lie to think the suspicion's were gone entirely, nontheless in public he is thanked for his efforts for helping to stop the spread of the Sigma Virus within Neo Arcadia's walls. Everything was finally looking up, though as he advanced and evolved his dream's have become far more vivid as well. He see's the crows in his dream clearly now as they descend and bite upon a city he does not know, whittling it further into rubble. Though even in it's decayed state he knows that it is not Neo Arcadia, and now he see's a lone figure in the ruins, walking aimlessly and there is nothing Crow can do to get it's attention. Almost right after seeing the figure in his dream's, Crow encounters a mysterious individual during an assault on a facility overtaken by Maverick's. An older human stood in the middle of a group of virus infected reploids and before Crow could act and defend him, he destroyed them all effortlessly, afterwards he examined Crow wordlessly, then with a curse he seemed to vanish instantly leaving no trace, as he had appeared. That night he experienced another nightmare, though with a different ending that awoke him screaming. Hearing a noise he went into the main lab and from Crow's visual record the man was standing in front of Dr. Cain's main screen which showed a larger vision of himself as pulled from Crow's memory and placed into the system for future identification. As he stared at Crow, he deleted the image and all the records of sightings within Neo Arcadia before he introduced himself as Damian Law and began speaking of his misunderstanding that brought him there. He spoke of someone who wreaked havoc in places Crow had never heard of, and he was mistaken at thinking he was Crow. It didn't take further explanation to understand who this man was hunting and though Crow was lost with this information, the two came to a mutual conclusion of this enemy who was the long sought after betrayer of Neo Arcadia, Vile. The two came to an understanding, if Crow assisted other world's in need of assistance, the trail would lead to Vile eventually and Crow could finally meet his wicked counterpart and begin living his own life as opposed to being the 'Vile Duplicate'. Law insisted they leave at once without any notification that he was ever there and Crow grabbed item's from the lab that Dr. Cain had either invented just for him, or still had salvaged from before yet had no understanding of how it worked then left with Law to see Vile and gain his own identity. Sigma Virus Detection, both form's have a way of detecting whether the Sigma Virus is being carried nearby in either a computer system or someone hosting it. Shoulder Cannon, heavy explosive round's are fired from his signature weapon. Rocket attachments, Rockets on his boots and back allow flight and maneuverability. Vulcan machine gun, a weaker bullet based weapon in his hand's that fires projectiles from his finger tips. Knee Cannon's, these fire large round's as well but he cannot be moving when he fires them though he can use them in the air much more effectively. Energy Blades, he can attach energy to his hands to create small swords that can also be launched and grow into large circular discs. Hacking, he can interact with software granting himself access to hidden files and documents, can also have a limited understanding of the system without having been there before. C-Cannon, he transforms either one or both hands into Crow Cannon's, they are devastating and can have rapid fire. Healing, draining nearby energy around him he can heal within a computer system as long as it has power. Energy shield, he can create a shield around him that is not very durable but is regenerated as long as power is in a computer system he is in. Armor: Would I put anything here? He technically.. IS armor. Special 4: Healing - Electricity can fuel nanites in his body to actively 'heal' damage. Re: Crow Application WIP COMPRETO! Needs a specific and short "wanted powers" section. Updated. Added a complete list of requested power's and you can decide what to give me. Need's to be read again.